Name Variation Barbara Janos was also known as Janousek. Married Name Her married name was Krejci. Barbara Janos married Frank Krejci. Surname from marriage record of son Joseph and daughter Rosa. Married Name 16 June 1908 As of 16 June 1908,her married name was Krejci. Louise K. Cochnar was born in 1888 at Czechoslovakia also reported as Czech Republic and Bohemia. She was the daughter of Anton Cochnar and Anna Vancura. 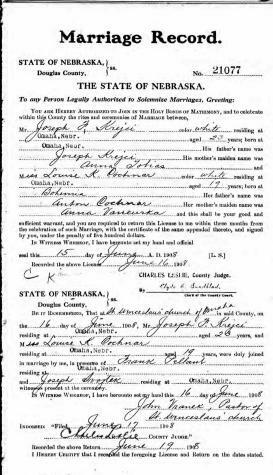 Louise K. Cochnar married Joseph Frank Krejci, son of Joseph Krejci and Anna Tobias, on 16 June 1908 at Omaha, Douglas, Nebraska, Louise Cochnar and Joseph Krejci marriage record. Louise K. Cochnar died in 1965. She was buried in 1965 at Saint Mary Cemetery, Omaha, Douglas, Nebraska. [S244] U.S. Federal Census 1910 U.S. Federal Census, by Ancestry.com, Year: 1910; Census Place: Omaha Ward 10, Douglas, Nebraska; Roll: T624_844; Page: 2B; Enumeration District: 0074; FHL microfilm: 1374857. [S243] U.S. Federal Census 1920 U.S. Federal Census, by Ancestry.com, Year: 1920; Census Place: Omaha Ward 5, Douglas, Nebraska; Roll: T625_988; Page: 3B; Enumeration District: 52. [S250] U.S. Federal Census 1930 U.S. Federal Census, by Ancestry.com, Year: 1930; Census Place: Omaha, Douglas, Nebraska; Roll: 1274; Page: 12A; Enumeration District: 0061; FHL microfilm: 2341009. [S373] U.S. Federal Census 1940 U.S. Federal Census, by Ancestry.com, Year: 1940; Census Place: Omaha, Douglas, Nebraska; Roll: m-t0627-02271; Page: 8B; Enumeration District: 94-67. Name Variation Charlotte Mlady was also known as Caroline. Name Variation Charlotte Mlady was also known as Melady. Married Name circa 1916 As of circa 1916,her married name was Krejci. Charlotte Mlady was born circa 1890 at Nebraska. She was the daughter of (?) Mlady. Charlotte Mlady married Frank Vincent Krejci, son of Joseph Krejci and Anna Tobias, circa 1916. Charlotte Mlady died on 4 July 1969. [S243] U.S. Federal Census 1920 U.S. Federal Census, by Ancestry.com, Year: 1920; Census Place: Omaha Ward 8, Douglas, Nebraska; Roll: T625_990; Page: 2B; Enumeration District: 91. [S250] U.S. Federal Census 1930 U.S. Federal Census, by Ancestry.com, Year: 1930; Census Place: Omaha, Douglas, Nebraska; Roll: 1276; Page: 23A; Enumeration District: 0093; FHL microfilm: 2341011. [S373] U.S. Federal Census 1940 U.S. Federal Census, by Ancestry.com, Year: 1940; Census Place: Omaha, Douglas, Nebraska; Roll: m-t0627-02272; Page: 10A; Enumeration District: 94-126. Married Name before 1940 As of before 1940,her married name was Baker. Mildred Alvina Krejci was born on 5 April 1918 at Omaha, Douglas, Nebraska. She was the daughter of Frank Vincent Krejci and Charlotte Mlady. Mildred Alvina Krejci married Richard Fielding Baker before 1940. Mildred Alvina Krejci died on 15 January 2006 at Omaha, Douglas, Nebraska, at age 87 BAKER, Mildred K. (Krejci), age 87, of Omaha. Preceded in death by husband, Richard and son, Kent. Survived by sons and daughters-in-law, Ron and Barbara, Daryl and Linda, Norman and Mary, Bob and Julie; 8 grandchildren; 10 great-grandchildren; 3 sisters-in-law, 2 brothers-in-law; many nieces and nephews. ROSARY Tues 7pm, Vinton St. Chapel. FUNERAL Wed 9:30am at the Mortuary to St. Adalberts Church at 10am. Interment Calvary Cemetery. VISITATION starts Tues at 4pm. She was buried after 15 January 2006 at Calvary Cemetery, Omaha, Douglas, Nebraska. Mildred Alvina Krejci was a stenographer for rubber company in 1940. She obtained US Social Security Card at Nebraska; last residence Omaha, Douglas, Nebraska. [S373] U.S. Federal Census 1940 U.S. Federal Census, by Ancestry.com, Year: 1940; Census Place: San Francisco, San Francisco, California; Roll: m-t0627-00316; Page: 12A; Enumeration District: 38-455. Name Variation Richard Fielding Baker was also known as R. F.
Richard Fielding Baker was born on 22 January 1916 at Omaha, Douglas, Nebraska. He married Mildred Alvina Krejci, daughter of Frank Vincent Krejci and Charlotte Mlady, before 1940. Richard Fielding Baker died on 4 July 1990 at age 74. He was buried after 4 July 1990 at Calvary Cemetery, Omaha, Douglas, Nebraska. Next of Kin: Mildred Baker. Name Variation Wilfred Charles Krejci was also known as W. C.
Name Variation Wilfred Charles Krejci was also known as Bill. Wilfred Charles Krejci was born on 9 April 1927 at Omaha, Douglas, Nebraska. He was the son of Frank Vincent Krejci and Charlotte Mlady. Wilfred Charles Krejci married Kathleen T. (?) after 1945. Wilfred Charles Krejci died on 30 August 2001 at age 74. He was buried after 30 August 2001 at Calvary Cemetery, Omaha, Douglas, Nebraska. Next of Kin: R F Baker (brother-in-law). Married Name before 1945 As of before 1945,her married name was Gunderson. Married Name before 1949 As of before 1949,her married name was Eckerman. Lenore Bernadette Krejci was born on 23 May 1925 at Omaha, Douglas, Nebraska, also reported as 23 May 1924. Lenore Bernadette Krejci married (?) Gunderson before 1945. Lenore Bernadette Krejci married Jerome Leonard Eckerman before 1949. Lenore Bernadette Krejci died on 6 January 1985 at age 59. She was buried after 6 January 1985 at Calvary Cemetery, Omaha, Douglas, Nebraska. (?) Gunderson married Lenore Bernadette Krejci, daughter of Frank Vincent Krejci and Charlotte Mlady, before 1945. Jerome Leonard Eckerman was born on 10 June 1918 at Westphalia, Shelby, Iowa. He married Lenore Bernadette Krejci, daughter of Frank Vincent Krejci and Charlotte Mlady, before 1949. Jerome Leonard Eckerman died on 20 April 1996 at Omaha, Douglas, Nebraska, at age 77 also reported as 20 May 1996. He was buried after 20 April 1996 at Calvary Cemetery, Omaha, Douglas, Nebraska. Adeline Loretta Krejci was born on 12 September 1922 at Omaha, Douglas, Nebraska. Adeline Loretta Krejci died on 3 November 1990 at age 68. She was buried after 3 November 1990 at Calvary Cemetery, Omaha, Douglas, Nebraska. Married Name after 1945 As of after 1945,her married name was Krejci. 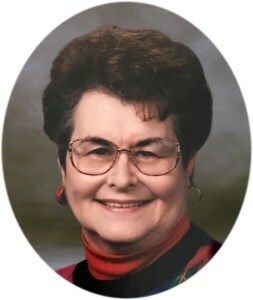 Kathleen T. (?) was born on 3 October 1935. She married Wilfred Charles Krejci, son of Frank Vincent Krejci and Charlotte Mlady, after 1945. Kathleen T. (?) died on 26 September 2017 at age 81 Preceded in death by husband, Bill “W.C. "; grandson, Aaron Krejci. Survived by children: Tim (Vicky) Krejci, Joan Krejci, Mark (Tammy) Krejci, Chris (Monica) Krejci; 12 grandchildren; 10 great-grandchildren. VISITATION begins Friday, 4pm, with a Wake Service at 6:30pm at the mortuary. FUNERAL: Saturday, 10am, St. Joan of Arc catholic Church. Interment Calvary Cemetery. Name Variation Rosalie Mary Krejci was also known as Rosa. Name Variation Rosalie Mary Krejci was also known as Rose. Married Name 14 January 1896 As of 14 January 1896,her married name was Kruml. Rosalie Mary Krejci was born on 12 September 1871 at Vodnany, Czechoslovakia, also reported as Bohemia. 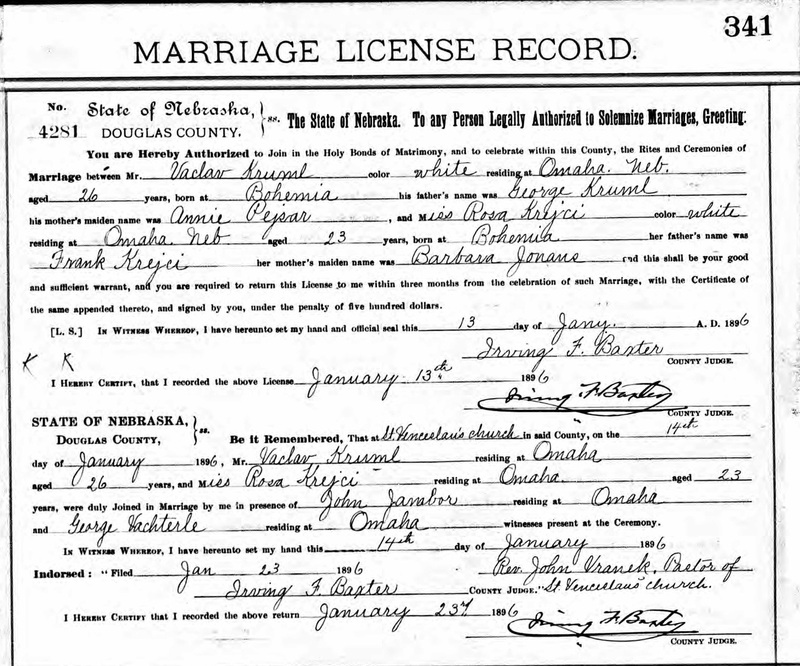 Rosalie Mary Krejci married James Matthew Kruml on 14 January 1896 at Douglas, Nebraska, Marriage of Vaclav Kruml and Rosa Krejci. Rosalie Mary Krejci was buried in February 1952 at Ord Cemetery, Ord, Valley, Nebraska. 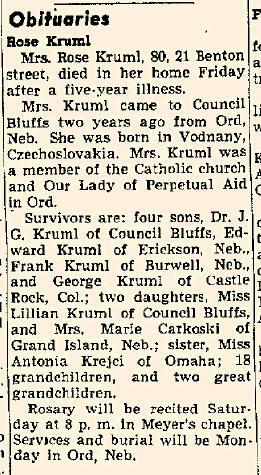 She died in February 1952 at Iowa at age 80 Rose (Krejci) Kruml obituary. Name Variation James Matthew Kruml was also known as Vaclav. James Matthew Kruml was born on 10 December 1869 at Bohemia. He married Rosalie Mary Krejci, daughter of Frank Krejci and Barbara Janos, on 14 January 1896 at Douglas, Nebraska, Marriage of Vaclav Kruml and Rosa Krejci. James Matthew Kruml died on 9 May 1944 at Ord, Valley, Nebraska, at age 74. He was buried after 9 May 1944 at Ord Cemetery, Ord, Valley, Nebraska. Name Variation Marie L. Krejci was also known as Mary. Married Name 14 November 1888 As of 14 November 1888,her married name was Rozajzl. Married Name 14 November 1888 As of 14 November 1888,her married name was Rozmajzl. Married Name 14 November 1888 As of 14 November 1888,her married name was Rosmajzl. Marie L. Krejci was born in December 1865 at Pribram, North Bohemia, Czech Republic, also reported as Dec 1866 in Bohemia. 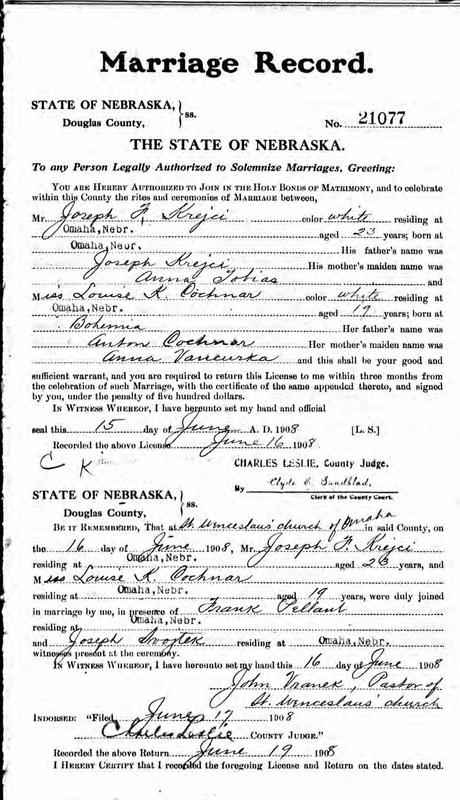 Marie L. Krejci married Frantisek Rozmajzl on 14 November 1888 at Omaha, Douglas, Nebraska. Marie L. Krejci died in 1943 at Omaha, Douglas, Nebraska. Marie L. Krejci immigrated in 1885. She had 6 with 6 living in 1900 children. She had 7 with 7 living in 1910 children. [S245] U.S. Federal Census 1900 U.S. Federal Census, by Ancestry.com, Year: 1900; Census Place: Omaha Ward 1, Douglas, Nebraska; Roll: 923; Page: 12; Enumeration District: 0006; FHL microfilm: 1240923. [S243] U.S. Federal Census 1920 U.S. Federal Census, by Ancestry.com, Year: 1920; Census Place: Omaha Ward 5, Douglas, Nebraska; Roll: T625_988; Page: 7B; Enumeration District: 51. [S250] U.S. Federal Census 1930 U.S. Federal Census, by Ancestry.com, Year: 1930; Census Place: Omaha, Douglas, Nebraska; Page: 6A; Enumeration District: 0062; FHL microfilm: 2341010. Name Variation Frantisek Rozmajzl was also known as Rozajzl. Name Variation Frantisek Rozmajzl was also known as Frank Rosmajzl. Frantisek Rozmajzl was born in 1858 at Bohemia. He married Marie L. Krejci, daughter of Frank Krejci and Barbara Janos, on 14 November 1888 at Omaha, Douglas, Nebraska. Frantisek Rozmajzl died on 1 November 1899 at Omaha, Douglas, Nebraska. He was buried after 1 November 1899 at Saint Mary Cemetery, Omaha, Douglas, Nebraska. John Krejci was born circa 1860 at Bohemia. He was the son of Frantisek Krejci. John Krejci married Anna Fiksa on 14 November 1886 at Omaha, Douglas, Nebraska. Married Name 14 November 1886 As of 14 November 1886,her married name was Krejci. Anna Fiksa was born circa 1866 at Bohemia. She married John Krejci, son of Frantisek Krejci, on 14 November 1886 at Omaha, Douglas, Nebraska. Married Name 15 August 1882 As of 15 August 1882,her married name was Baudhauer. Emily Krejci was born circa 1860 at Bohemia. She was the daughter of Frantisek Krejci and Barbara Krumphauzal. 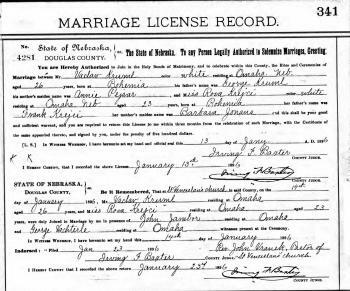 Emily Krejci married Frank W. Baudhauer on 15 August 1882 at Omaha, Douglas, Nebraska. Frank W. Baudhauer was born circa 1855 at Missouri. He married Emily Krejci, daughter of Frantisek Krejci and Barbara Krumphauzal, on 15 August 1882 at Omaha, Douglas, Nebraska. Name Variation Frank Krejci Jr. was also known as Franz. Frank Krejci Jr. was born circa 1851 at Bohemia. He was the son of Frantisek Krejci and Barbara Krumphauzal. Frank Krejci Jr. married Francis Plak on 25 January 1887 at Exeter, Fillmore, Nebraska. Frank Krejci Jr. immigrated with Frantisek Krejci and Barbara Krumphauzal on 13 May 1879 at Bremen, Germany to, Baltimore, Maryland. Name Variation Francis Plak was also known as Flak. Married Name 25 January 1887 As of 25 January 1887,her married name was Krejci. Francis Plak was born circa 1863 at Bohemia. She married Frank Krejci Jr., son of Frantisek Krejci and Barbara Krumphauzal, on 25 January 1887 at Exeter, Fillmore, Nebraska. Vaclav Krejci was born on 1 December 1894 at Exeter, Fillmore, Nebraska. Name Variation Barbara Krumphauzal was also known as Krumphanze. Name Variation Barbara Krumphauzal was also known as Kral from marriage record of son John. Barbara Krumphauzal married Frantisek Krejci. Barbara Krumphauzal was born on 23 March 1838 at Bohemia. She died on 4 May 1908 at Nebraska at age 70. Barbara Krumphauzal and Frantisek Krejci immigrated on 13 May 1879 to Bremen, Germany to, Baltimore, Maryland. From marriage record of daughter Emily and son Frank. Frank Krejci married Barbara Janos. Charles Mlady was born circa 1887 at Nebraska. He was the son of (?) Mlady. Charles Mlady died after 1940. Joseph Anton Krejci married Louise Ann Roza. Joseph Anton Krejci was born on 31 March 1913 at Omaha, Douglas, Nebraska. He was the son of Joseph Frank Krejci and Louise K. Cochnar. Joseph Anton Krejci died on 2 May 1997 at Omaha, Douglas, Nebraska, at age 84. He was buried after 2 May 1997 at Calvary Cemetery, Omaha, Douglas, Nebraska. Louise Ann Roza married Joseph Anton Krejci, son of Joseph Frank Krejci and Louise K. Cochnar. Louise Ann Roza was born on 27 March 1920 at Omaha, Douglas, Nebraska. She died on 13 June 2016 at Omaha, Douglas, Nebraska, at age 96 Krejci, Louise A. Mar 27, 1920 - Jun 13, 2016 Preceded in death by husband Joseph. Survived by daughter Marge (Jack) Egermier; sons, Joe (Barb) and Bernie (Patti); grandchildren, Debbie, Rick, Krissy, Ron, Jenni, Brian, Laurie and Julie; 18 great-grandchildren. VISITATION begins Thursday, 4pm with a Wake service at 6:30pm at the mortuary. FUNERAL Friday, 9:30am at the mortuary to Assumption Catholic Church at 10am. Interment Calvary Cemetery. She was buried after 13 June 2016 at Calvary Cemetery, Omaha, Douglas, Nebraska. Marie Louise Krejci was born on 3 May 1915 at Omaha, Douglas, Nebraska. She was the daughter of Joseph Frank Krejci and Louise K. Cochnar. Marie Louise Krejci died on 24 September 1999 at age 84. She was buried after 24 September 1999 at Calvary Cemetery, Omaha, Douglas, Nebraska. Name Variation Reverand Father Albert L. Krejci was also known as Monsignor Albert L. Krejci. Reverand Father Albert L. Krejci was born on 22 June 1917 at Nebraska. 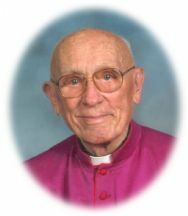 Reverand Father Albert L. Krejci died on 17 February 2011 at age 93 Monsignor Albert L. Krejci. Preceded in death by parents, Joseph and Louise; brother Joseph; sisters, Marie and Frances Pouzar; niece Dotti Richmond. Survived by niece Margaret Egermier (Jack); nephews, Joe Krejci (Barb), Bernie Krejci (Patti) all Omaha, Robert Pouzar (Sherri), Rowlett, TX, Frank Pouzar (Gaylin), Dallas, TX, Edward Pouzar, New York, NY; sister-in-law Louise Krejci, Omaha; many great nieces, nephews and their families; and many, many friends. WAKE SERVICE Monday 7pm at St. Bernadette Catholic Church. FUNERAL Tuesday 10:30am, St. Bernadette Catholic Church. Interment, Calvary Cemetery. Memorials to St. Bernadette Church or to the family for a charity of their choice. VISITATION begins Monday 4pm at the Church. He was buried after 17 February 2011 at Calvary Cemetery, Omaha, Douglas, Nebraska.